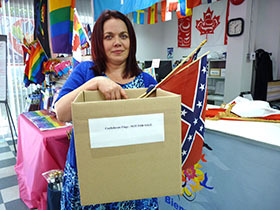 Vancouver, BC (June 24, 2015) - The Flag Shop announces that, effective Monday June 22, all thirteen locations of The Flag Shop have removed the Confederate Flag (or Battle Flag of North Virginia) from the stock product line. "The Flag Shop offers all of the current flags of the US States as well as a number of historical flags," says Susan Braverman, President of The Flag Shop, "but when a historical US flag is increasingly used by racist groups as a symbol of hate, it makes me sick to my stomach. I knew it was time for us to remove the Confederate Flag from our stores." The Flag Shop has added the Confederate flag to its list of flags that will not be sold to the public. This list includes the flags of World War II Germany, the flag of Rhodesia, and the flag of apartheid-era South Africa. Museums, the film industry, and others with a genuine historical need may still contact us and will be considered on a case-by-case basis. The Flag Shop does not condone or allow racism or racist behaviour in any way, shape or form and we are doing what we can to support positive messages of dignity, equality, diversity and safety amongst all Canadians. We are national advocates of Anti-Bullying, proud supporters of PRIDE and the LGBT+ communities and committed to the teachers of our children throughout Canada. Businesses and government agencies interested in advocating positive corporate social responsibility and acting for the benefit of society are invited to contact The Flag Shop to discuss how we might work together in Canada. At the First Battle of Manassas, near Manassas, Virginia, the similarity between the "Stars and Bars" and the "Stars and Stripes" caused confusion and military problems so General P. G. T. Beauregard resolved to have the Confederate flag changed or to adopt a "Battle flag", which would be entirely different from any State or Federal flag. His aide, William Porcher Miles, designed a flag where each state in the Confederacy was represented by a star and on November 28, 1861 General Robert E. Lee's newly reorganized Army of Northern Virginia received the new battle flags in ceremonies at Centreville and Manassas, Virginia, and carried them throughout the Civil War. From that point on, the Battle Flag of North Virginia grew in its identification with the Confederacy and the South in general. It was used in battle until the fall of the Confederacy and became known as the Confederate Flag. During the first half of the 20th century, the Confederate flag enjoyed renewed popularity. During World War II some U.S. military units with Southern nicknames, or made up largely of Southerners, made the flag their unofficial emblem with some soldiers carrying Confederate flags into battle. By the end of World War II, the use of the Confederate flag in the military was rare, however, from 1979–1985 the American television series The Dukes of Hazzard, set in a fictional Georgia county, featured the General Lee stock car with a prominently displayed Confederate naval jack on its roof throughout the series' run. In the 1994 movie, Forrest Gump, a Confederate flag can be seen at a US Army camp in Vietnam. The Confederate battle flag was reintroduced as an element of the In Georgia, state flag in 1956 and it has never been officially removed as an integral part of the Mississippi State Flag. It has also been used on the license plates of Virginia since 1999 and was flown on the South Carolina Capital Building from 1962 – 2000, at which time it was removed and reinstalled at the Confederate War Memorial located immediately adjacent to the State Capital Building. Supporters of the flag's continued usage, view it as a symbol of Southern ancestry and heritage as well as representing a distinct and independent cultural tradition of the Southern United States from the rest of the country. They perceive the Confederate flag as representing heritage, not hate. However, over the years, the historically significance of this flag has increasingly been usurped by organizations and individuals that promote hatred and racism in America. Finally on June 22 Governor Nikki Haley ordered the removal of the Confederate Flag from South Carolina State capital buildings, and yesterday Virginia Governor Terry McAuliffe ordered the symbol removed from newly issued Virginia car license plates.